Fall-blooming plants like Chrysanthemum dendranthema 'Cambodian Queen' are a very important source of nectar and pollen late in the season, and on a pleasant sunny fall day can be like Grand Central Station in the insect world. Because there is not much in bloom this time of the year, flower-visiting insects tend to congregate on the few plants that are in bloom. Just casually glancing recently at this pretty pink perennial mum stopped me in my tracks for what turned out a very rewarding flower watch. 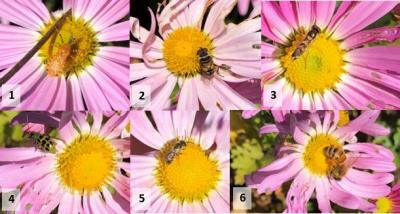 Not only were there bumblebees, honeybees (6) and various butterflies working the flowers, but also hoverflies, a.k.a. flower flies in the family Syrphidae (2 and 3), sweat bees (5), spotted cucumber beetles (a.k.a southern corn rootworm) (4), and orange assassin bugs (1) just to name a few. You'll notice right away that many hoverflies have ornate body patterns, often of black and yellow, to mimic wasps and bees. And if you feel safe enough to look more closely, you might discern they have only two wings, meaning they are in the fly order (Diptera) and cannot sting. And yes, some flies do bite (think mosquito or horsefly), but hoverflies are nevertheless in the harmless group. You'll also find they are easily distinguished from bees or wasps by their huge eyes that seem to cover most of their head. Plus, they are amazing flyers and get their name for their ability to hover like a helicopter. Adults (flies) feed on pollen and nectar in flowers, while the larvae (maggots) are voracious predators of aphids and other small, slow-moving insects. Some hoverfly species overwinter as adults, though most overwinter as larvae in leaf litter; further emphasizing the need to maintain adequate leaf cover for beneficial insects. The orange assassin bug (Pselliopus sp.) truly looks like a nasty piece of work, but all the same, strikingly beautiful. Like other assassin bugs, this true bug (Hemiptera) is predatory and feeds on other insects…not being particular who it catches. These patient hunters may either stalk their prey, or quietly wait for an unsuspecting insect to come within reach, then suddenly attack with their dagger-like, piercing-sucking beak. A word to the wise; some assassin bugs can and will deliver a painful bite if picked up and handled carelessly. They overwinter as an adult, usually sheltering under loose bark, rotting logs, or stones. Eggs are laid sometime during the spring (March-May) in loose, circular clusters. The nymphs in turn emerge June-August, taking about 85 days after the egg hatches for it to develop into an adult. 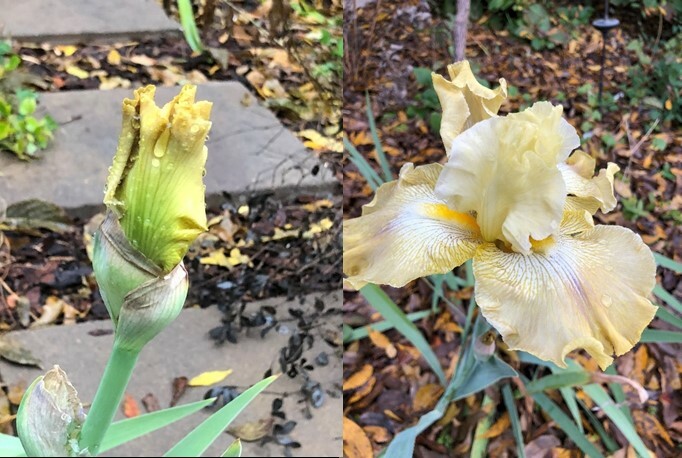 Another late fall flower for our area is a reblooming (remontants) iris, though freezing fall temperatures can damage blooms before they have a chance to even open in some years. But this year 'Again and Again' managed to bloom ahead of a killing freeze. I try to plant these types close to the front door so they can be admired by all who arrive…and from the cover of the front porch during rainy weather. Still, even in named reblooming varieties, reblooming may or may not occur every year. All cultivars vary in their ability to rebloom according to their genetic makeup, plant age and environmental growing conditions. Whereas 'Again and Again' came as promised this year, 'Zee,' 'Summer Olympics' and a host of others just didn't get what they needed to perform again. Maybe next year will be better.